Any hunter would agree that you need to know a bit about the game your hunting, before you actually go out on the hunt—especially when it’s a Texas turkey hunt. 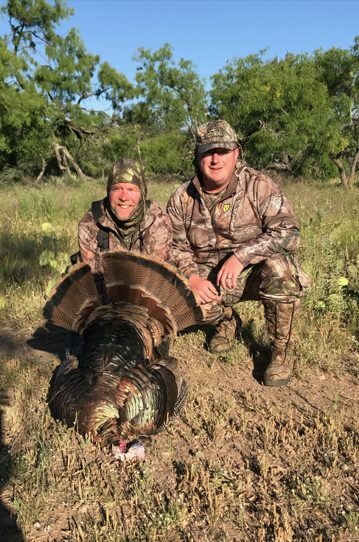 At Schmidt Double T Ranches, we have plenty of experience with the wild Rio Grande turkeys and it’s no secret that these birds are an elusive game to hunt. On our Texas turkey hunts, we’ve been able to figure out exactly what it takes to get a turkey tagged, and it starts with understanding turkey sounds and the most effective calling methods. You won’t be able to tag a turkey, if first you can’t locate one, and second, you can’t reel them in. Study up on a few of the most important turkey sounds that will help you find success on your hunt! Male turkeys earned the nickname “gobbler” because of the famous call that anyone would recognize. The gobble is a loud, throaty sound that reminds us of a rooster’s crow. When you hear this familiar turkey sound, you can assume the gobbler is high up in his roost, since the call can travel further higher off the ground. It’s a series of oddly spaced notes that heightens in pitch towards the end. When you hear a cackle, it usually indicates that a tom is leaving his roost. However, these birds also cackle when flying back up to their roosts. Both calls have their advantages when it comes to hunting the birds. Use a fly-down cackle to let a tom know there’s a hen on the ground. This call works best when the tom is also on the ground, or else he might stay persistent in waiting up at his roost for a hen to come to him, instead of the other way around. When you’re trying to locate your tom in his roost, a fly-up cackle may encourage that tom to gobble, successfully revealing his position. One of the more basic turkey sounds you’ll encounter is the yelp. The sound is usually used by a hen to communicate with a tom during mating season and is one of the most popular turkey calls utilized by Texas hunters. Visit the National Wild Turkey Federation to listen to recordings of the different turkey sounds you’ll hear when out on the hunt! Turns out, there are plenty of ways to distract this type of game in order to get your shot. It’s all about the way you call. The art of turkey calling actually starts with finding the right tone and rhythm to replicate a turkey naturally. When focusing in on your target, be sure to try different tones. 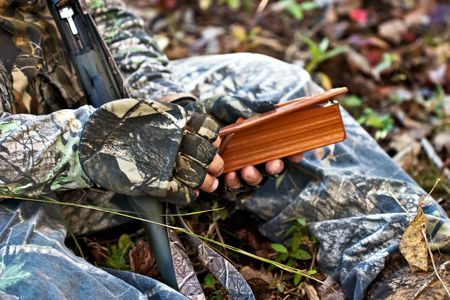 No hen sounds as perfect as the sound you’re replicating with your box call, so a couple different pitches will help make your call seem more natural and luring. Or maybe your tone isn’t the problem at all—maybe, it’s the cadence at which you’re calling. An unnatural rhythm won’t fool a tom, so with this element of turkey calling, practice makes perfect. 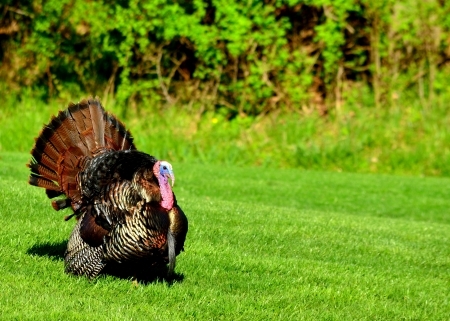 Take some time to listen to live turkey sounds and expert callers to get a sense of the rhythm you need to replicate. Sometimes, it’s easy to get too much in your head and call like crazy, overusing the yelp and never taking a break to listen. Well, that’s because you’re thinking like a turkey hunter, instead of the turkey you’re hunting. So, take some time before your hunt to really listen to the turkeys as they sit in their roosts. You want to fit in with their sound and gain a natural feel for the call. And why don’t you widen that turkey vocabulary while you’re at it, so you can give the basic yelp a rest every once in a while! In the spring, turkeys are looking to find their mate after the long winter, so sounding like a hen could be your best bet in attracting a male. These toms are usually more distracted with their eye on the prize (a hen). Little do they know, you have your eye on another prize (them!). What call should you use on a turkey hunt? When you’re not lucky enough to stumble upon a tom strutting, you’re going to have to work a little bit to find him. But, that task is made easy with a locator call. With locator calls, the goal isn’t to attract the gobbler, it’s to trick him into giving you his exact position. These shock calls resemble owls, woodpeckers, crows and other animals that will hopefully result in a tom’s gobble. Listen carefully: if they’re near, you can set up where you are and wait. If they are farther away, repeat your calls until you grow closer to your target. Diaphragm, or mouth calls, are one of the most effective types of calls while out on a turkey hunt in Texas. Why? Because they produce some of the most realistic turkey sounds you can without being an actual turkey. They’re easy to carry, but more difficult in implementation. Make sure you pick up a mouth call and practice before your hunt. The last thing you want to do is take a new call out without being familiar with it first! When you can’t rely on your mouth to make the call, box calls and push/pull calls come in handy. These types of turkey calls, you slide a wooden striker against a resonating box and the sound highly resembles the call of a turkey. Experienced hunters can make the turkey box call sound like a tom, a male turkey, or a hen. You can attract both with the right kind of box, it just takes some practice! Now that you’re an expert at turkey sounds and calling, all you have to do is get out there and score that tag! Looking to plan your next hunting trip? 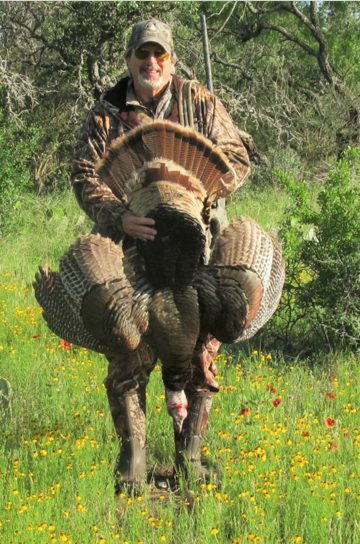 At Schmidt Double T Ranches, we have some of the best turkey hunting in Texas. Check out our turkey hunting packages and we’ll see you this spring!